Need to satisfy that Chinese craving? Do you like Orange Chicken? Want to do it in a healthy and quick fashion?? 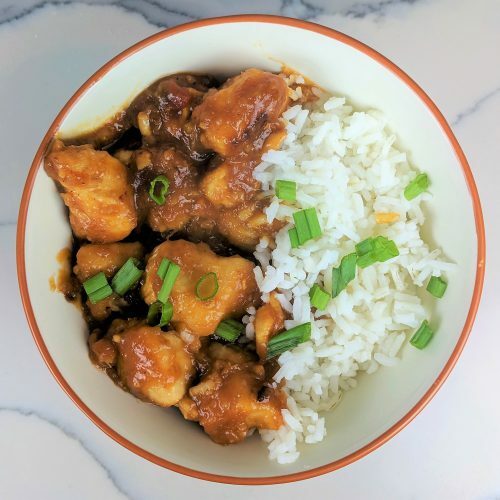 This Instant Pot Orange Chicken is your answer! I love Orange Chicken. What I don’t love about Orange Chicken is how unhealthy it is. (News Flash: anything fried is not usually classified as healthy). 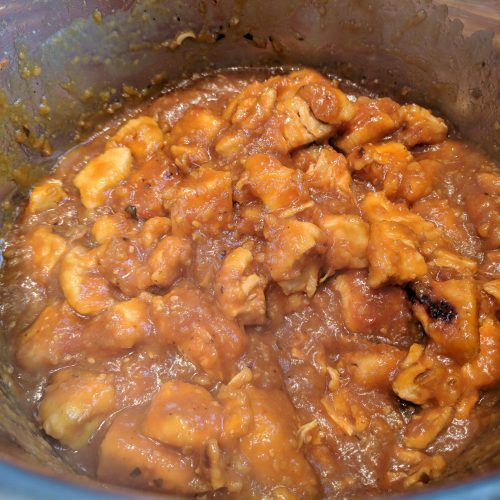 This was my first instant pot experience and even though it was a learning curve, the recipe came out DELICIOUS! I didn’t miss the fried aspect at all and it is the perfect dish to satisfy that craving. I adapted this recipe from Sweet and Savory Meals. I changed it up and tossed the chicken in cornstarch before sauteing and sauteed the chicken on the stove top first. I also changed up some of the proportions to meet my tastes. Per serving this recipe has 500 calories, 9g fat, 53g carbs and 50g of protein. 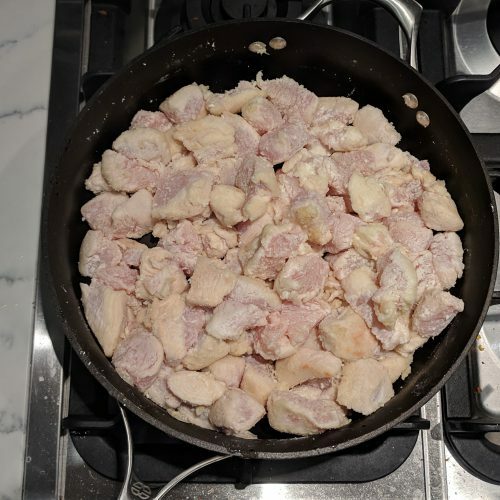 If you want to cut some of the carbs, don’t toss the chicken in cornstarch first. That will eliminate 10g of carbs per serving. 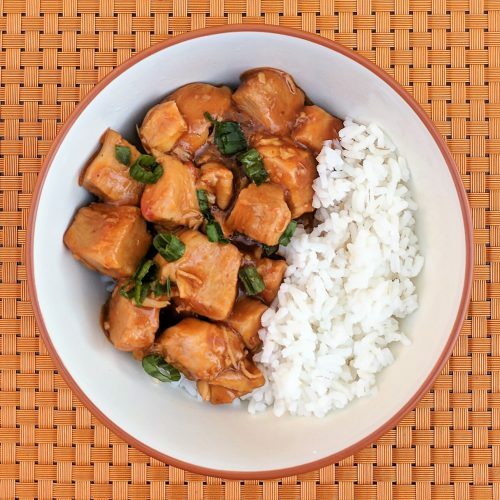 To make this recipe Gluten-free use gluten-free soy sauce or Tamari. I served this with white rice to give me that authentic Chinese feel. Remember everything in moderation! To make this in the crock-pot, follow steps 1, 2 & 3 below. 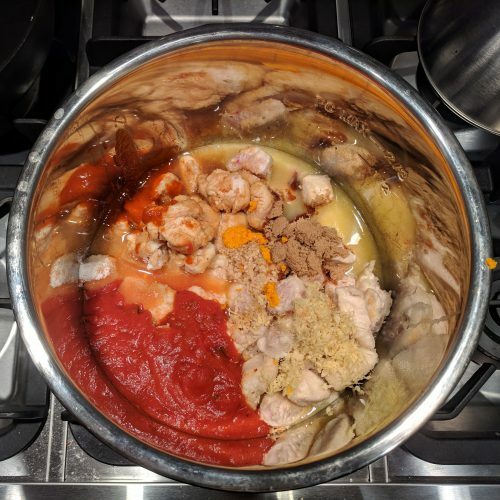 Instead of putting the chicken and sauce in the Instant Pot, put it in the crock-pot. Cover and set crock-pot on low for low for 4 hours. Make the slurry, gently stir it in and cook on high for 20 more minutes. #1 When dicing the chicken don’t worry about a specific size measurement. Just think about what bite size means to you and cut them accordingly. #2 Don’t skip out on the orange zest! It makes a huge difference! Click here to view/buy the zester I use! #3 While the chicken is cooking in the Instant Pot. Clean up! Then you will be rearing and ready to go by the time it is done! heat 3 tbsp olive oil over medium high heat. add cubed chicken and saute for approximately 7 minutes or until it starts turning golden color. 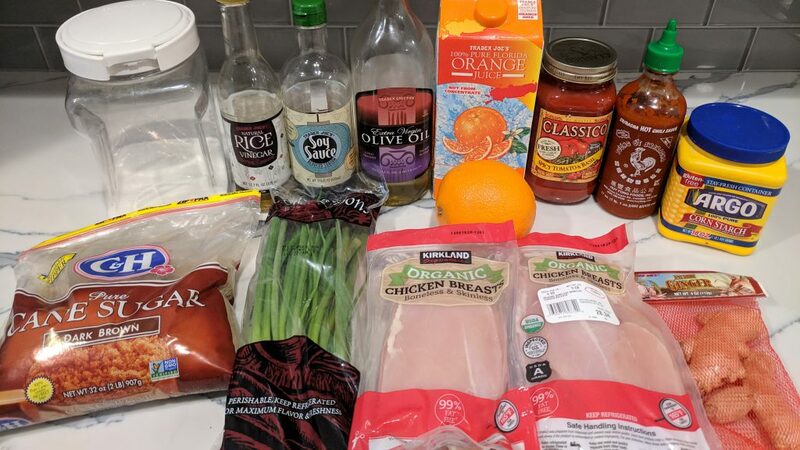 add chicken and all sauce ingredients to Instant Pot. Stir. 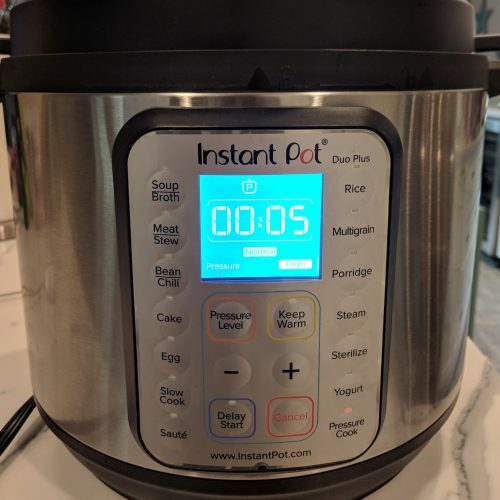 Set Instant Pot on manual high for 5 minutes. make sure vent is set to sealed. Use 10 minute natural release (let IP go into warm mode and wait 10 minutes. then turn knob to venting release the rest of the air). 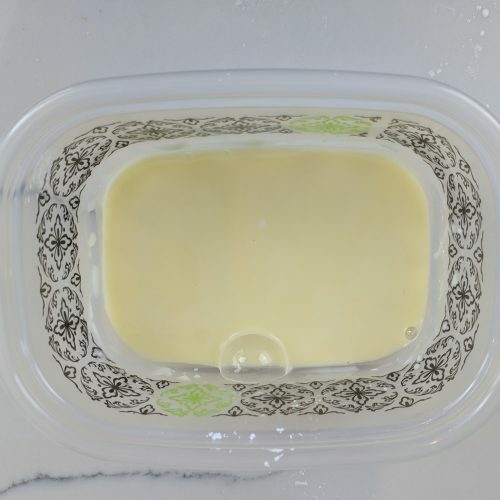 while Instant Pot is doing its thing, make white rice (or cauliflower rice) and make the cornstarch slurry by whisking the ingredients together. when Instant Pot is done switch function to saute on low. add cornstarch slurry and stir gently for a couple minutes until sauce begins to thicken. serve with white rice, cauliflower rice. Top with green onions and extra orange zest if desired. 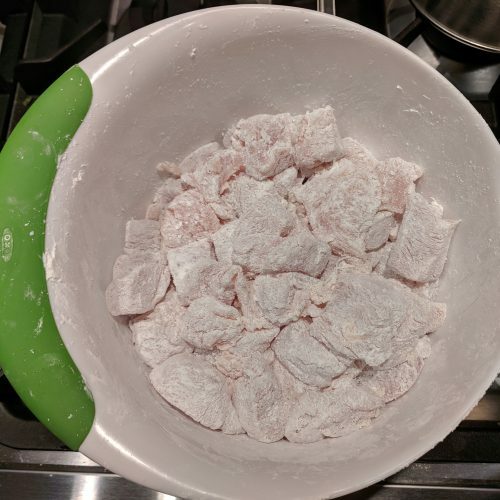 I was very excited to try this but I don’t have an instant pot so I tried the tip on the recipe link to cook it in the crockpot. It was delicious!! I also used fresh squeezed OJ. 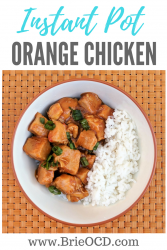 My family is a big fan of orange chicken so I was thrilled that I had a healthier alternative to feed them. glad you liked it! also try my sesame chicken recipe! I will also have a kung pao recipe coming out later this week!